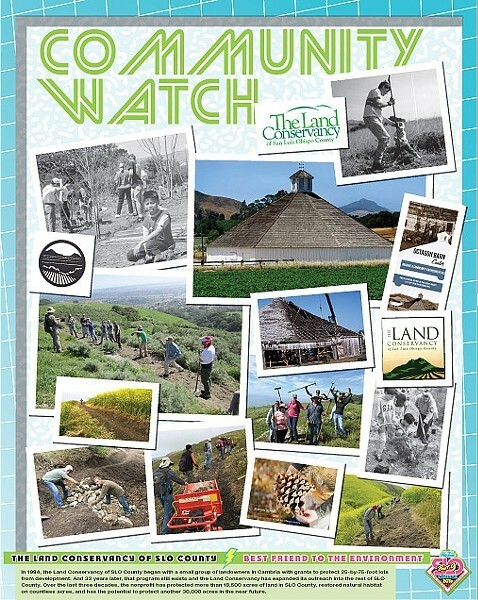 BEST FRIEND TO THE ENVIRONMENT: THE LAND CONSERVANCY OF SLO COUNTY: In 1984, the Land Conservancy of SLO County began with a small group of landowners in Cambria with grants to protect 25-by-75-foot lots from development. And 32 years later, that program still exists and the Land Conservancy has expanded its outreach into the rest of SLO County. Over the last three decades, the nonprofit has protected more than 18,500 acres of land in SLO County, restored natural habitat on countless acres, and has the potential to protect another 30,000 acres in the near future. John Wallace’s tenure as the South SLO County Sanitation District’s top administrator ended on a sour note in 2015. Wallace left the district amid allegations that he used his position to send millions of ratepayer dollars to his own private engineering firm. A costly audit of the district financials and Wallace’s management practices revealed that the firm, the Wallace Group, received more than $6 million for administrative fees, engineering fees, and major budget item projections, between 1999 and 2010. It also raised the specter of possible criminal malfeasance. Wallace has repeatedly denied the allegations, questioned the audit, and maintained that the billings from his company to the district were legitimate and approved by its board of directors. After more than 18 months of construction, SLO city residents finally get to see some relief from the frustrating traffic at the Los Osos Valley Road interchange. The city’s largest capital improvement project cost an estimated $24.5 million for the construction alone and about $35.3 million total. As of late April, the project is essentially finished, according to Kyle Rowland, the project’s manager. While the construction may have been a headache for SLO drivers, Rowland said most people acknowledged the need for the project, and he thanked the public for their patience. “The cooperation from the public was amazing,” Rowland said. The longtime local politician has done well for himself and his district, readers say. Known commonly as Katcho, he has a reputation of being well-liked both in district and in Sacramento. That friendliness extends beyond his politics and has allowed him to garner plenty of support during his political ascendancy, all while staying clear of any major scandals or controversies. Katcho will term out of the state Assembly this year, and he’s currently aiming to take Congresswoman Lois Capps’ open seat. It will be the toughest election he’s ever faced. SLO County is a busy place, and when SLO residents want breaking news, they apparently want it as close to instantly as possible. Whether it’s a wildfire in the rugged hills, a police chase, or yet another vehicle wreck snarling traffic along the 101, SLO Stringer is on the scene, posting the information, pics, and video to his—or her—popular Facebook and Twitter accounts. Who is SLO Stringer? No one is sure. The mystery man (or woman) behind the accounts didn’t return requests from New Times for comment. This writer pictures an intrepid citizen with a mask and cape, smartphone in hand, waiting to swoop in and get the latest scoop online for his (or her) adoring followers. We can’t count how many times Woods Humane Society has taken the Best Nonprofit award in New Times’ history. It would take too much staff time. Safe to say, since 1955, Woods has worked heroically to find loving homes for dogs and cats, provide spay/neuter surgeries, and offer dog training classes, humane education for children, and pet visitation for seniors. “The support of our community makes it possible for Woods to touch the lives of thousands of animals each year,” Executive Director Jill Tucker said. Be on the lookout for an even larger Woods presence, as they plan to build a much-needed clinic in North County.